I am on the Board of Directors for Orange Little League and thought it would be cool to get a silent auction together to raise funds for field renovations. I sent out donation request letters to local sports teams for autographed or game used items to be used for the silent auction at Orange Little League’s Pancake Breakfast on February 21st. 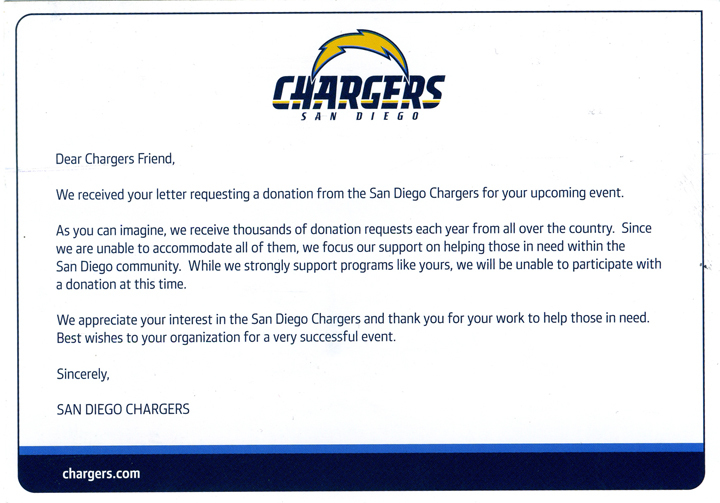 Last week I received a rejection notice from the San Diego Chargers stating that they receive thousands of requests from all over the country and since they can’t accommodate all of them, they focus on helping those in need in the San Diego community. I was a bit miffed thinking they could have provided a simple 8×10 photo ($3 cost) signed by a player but I accepted their explanation that they only donate to the San Diego Community. Today I was quite peeved when I read in the OC Register that the San Diego Chargers have signed a deal with the Wasserman Media Group to market Southern California’s only NFL Team in Los Angeles and Orange Counties. They are trying to get them to help sell luxury suites and club seats to fans in LA and Orange Counties. I live in Orange County and have attended a Chargers game every year since 2000. 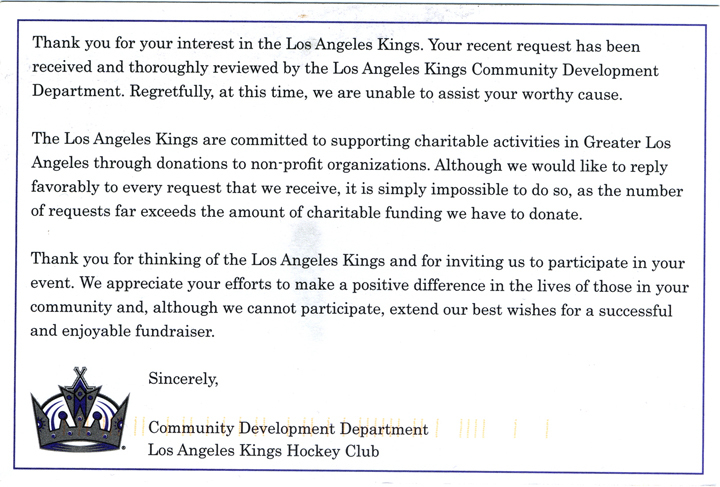 I find it pretty sad that they want to take our money but they can’t help our community. I guess this goes to show what kind of organization the Chargers truly are. FYI, so far the Angels have stepped up by donating a signed Juan Rivera major league baseball and the Dodgers have donated 4 vouchers good for tickets to a game next season. The silent auction is on February 21st at the Orange Little League Fields. Stop by if you’re interested in bidding. We will have other great items as well.